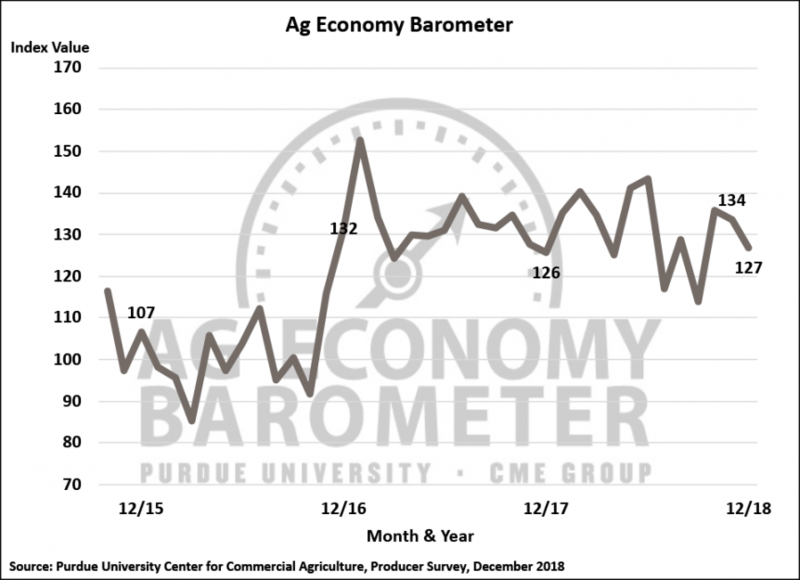 The Purdue University/CME Group Ag Economy Barometer declined moderately in December to 127, seven points below the index’s value one month earlier. Purdue/CME Group Ag Economy Barometer, October 2015-December 2018. The Barometer is a monthly nationwide measure of the health of the U.S. agricultural economy. A rating below 100 is negative, while a rating above 100 indicates positive sentiment regarding the agriculture industry. The December 2018 barometer was virtually unchanged from December 2017 when the barometer stood at 126. The monthly decline however in the Ag Economy Barometer occurred because producers’ perceptions of current conditions and their expectations for the future both drifted lower this month compared to November. Organizers say it should be noted that this month’s survey was completed before President Trump signed the 2018 farm bill into law, and before the government shutdown began. The survey says international agricultural trade issues continue to cause concern and could be causing producers’ reduced confidence in current economic conditions.